In Necropolis, you work even after you’re dead. Your corpse is state property, reanimated as a mindless undead laborer. It is an industrialized city-state powered by reanimated perpetual motion machines. If it can be powered by crank, piston, or gear, you’ll find it worked by a skeletal hand. Ryan Deugan was one of the Power backers for Kingdom but, instead of having me make a seed, he decided to write it himself. 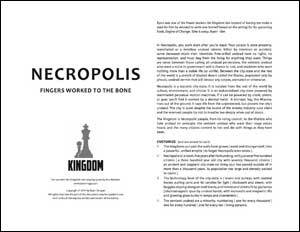 Necropolis is the setting for his upcoming book Engine of Change. Will you work the undead to dust to keep the lights burning or cast out the vile abominations?